Largehearted Boy: Book Notes - W.B. Belcher "Lay Down Your Weary Tune"
Book Notes - W.B. Belcher "Lay Down Your Weary Tune"
W.B. 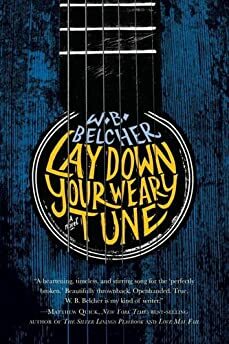 Belcher brings the worlds of folk music and upstate New York to life in his debut novel Lay Down Your Weary Tune. "Mingling elements from both literature and the blues, Belcher has crafted a memorable tale about how the masks and myths we create can become prisons that ultimately disconnect us from ourselves." Lay Down Your Weary Tune is narrated by Jack Wyeth, a hapless writer and sometimes musician who, for reasons unknown at first, interprets the world through the songs, musicians, and stories from the folk music revival and its aftermath. Nearly 50 songs/musicians are mentioned in the book, from Kate and Anna McGarrigle to David Bromberg, from "Where Have All the Flowers Gone" to "I'll Fly Away," from The Yardbirds to Bruce Springsteen. The novel also references fictional songs by one of its main characters, the reclusive, mercurial Eli Page, who wrote classics like "Upcountry Blues," "The Ballad of the Listless Gambler," and "Maybe the Time's Not Right." Most of the songs on the playlist below are traditional, or they stem from traditional roots. (Even though I've noted particular versions.) Like the characters themselves and the various physical settings in the novel, the songs change, shift, and evolve through time – they are reused, recycled, and reinvented. The folk process is alive in this novel, and with it the idea that music is shared across generations, that it's malleable, and that it's always there with us, buried in our DNA. That's Jack's belief, and this is his playlist as much as it's mine. Well, let's just start with the big one. Whenever I'm asked why I choose this particular song as the book's title, I refer people back to Dylan's recording, which was released on Biograph (although recorded much earlier). Juxtaposing man-made music with nature's rhythm, the song connects the river's hum, the morning breeze, and the crashing waves to bugles, harps, and cymbals. At the beginning of the novel, Jack notes "everything is music." He draws similar connections, which are only heightened by his time with Eli Page. On a different level, when Jack accepts the ghostwriting job, he sets out to tell Eli's "weary tune," but by the end, he has in fact told his own. Jack was born restless. As a kid, he tries and fails to run away. Eventually, he leaves for college, but he feels anchorless, unattached. Like his hero Eli Page, Jack romanticizes the wandrin' and ramblin' men in Woody Guthrie songs, but Jack is of a different era, and the hardships of the worker, the miner, the farmer are lost on him, until he begins to open up his point of view. Another character in the novel, Ivory Belanger, proprietor of Belanger's Barn, is a former preacher turned collector of antiques and Americana. When Jack first meets him, Ivory is humming this Johnny Cash/Hank Williams, Jr. tune, which is about the cycle of time and the reversal of fortunes. I love that it's at once a "turn the other cheek" song, as well as a revenge, you'll get your comeuppance song. Early in the novel, when Jack is remembering the first time he met Eli Page, he recalls Eli playing this version of the song, which was made popular by Pete Seeger and The Weavers. Instead of The Weaver's softer "I'll see you in my dreams," Lead Belly sings "I'll get you in my dreams," which has a haunting quality that fits with Eli's personality. Referring back to the earlier version was also a way to shine a light on the folk process, which is a reoccurring theme in the novel. Where do I start with this song? Of course, "The Water is Wide" is a traditional song that has been around for centuries. There is even some discussion of whether "Lay Down Your Weary Tune" was structured after "O Waly Waly," which is the root of "The Water is Wide." I love the Pete Seeger versions, especially the sing-a-long in 1980, where the swell of voices under his gentle instruction can almost bring me to tears. As far as its relationship to the novel – it hits all the marks. The community chorus / call-and-response, the image of the river, the struggle to get across it, and so on – these are all things I was thinking about when building Eli's story. Right from the start, this song speaks to Eli Page's state of mind. "Someone's got it in for me / they're planting stories in the press." Years before the novel begins, Eli left the public eye and relocated to a tiny upstate New York village on the border of New York and Vermont. His relationship with the public is complicated, but he is no doubt skeptical of their gaze. "Idiot Wind" is at once angry and almost contrite. In the last verse, when the speaker switches from a very pointed "you" to more inclusive "our" and "we," he gives us the sense that he knows he's partially to blame for it all falling apart. This is how Eli lives, at once at odds with the world but also deeply angry at himself. This song really enters the world and sensibility of the novel, and it connects to some of the key characters' storylines. On a side note, I could listen to this song 20 times in a row. It's at once sweet and sorrowful. When I think of some of the characters – from Jenny Lee to Hadley and Eliza – this song comes to mind. This is another Dylan song that has an interesting tone – one that connects to Eli Page's own view of the world, his inner conflict, and his longing. There's a powerful moment in the song, when Dylan sings "I can change, I swear" that you sense the longing and remorse (or, perhaps, you project your own). I choose the recent Rosanne Cash version from The List, which is an incredible playlist by itself, but this is a traditional song that The Carter Family popularized in the 1930s (I believe). The song really connects to the emotional landscape of a couple characters in the novel, including Eli Page's own backstory and one of the reasons he moved to the town of Galesville. I love this song, sang in Dave's gravelly voice, but many may know this song from Judy Collins or Joni Mitchell, who wrote it. It's been covered a million times. I think this song speaks to some of the book's discussion of masks, personae, and how the illusion of fame can obscure the truth, love, life, and so on (or supplant the truth). That's an over-simplification, but it's a wonderful song to revisit. This is probably the first Dylan song that I fell in love with, back in high school when listening to The Freewheelin' Bob Dylan cassette in my beaten up Trans Am. Storywise, it's a song that will come to mind for many, and the Nashville Skyline duet with Johnny Cash is even mentioned in the book. As I mentioned, these 11 songs are a small sample of the songs that work their way into the novel. There are a few additional songs that I want to mention, even without explanation, since they are relevant to the novel. These include Joan Baez's "Diamonds & Rust," Richard and Mimi Farina's "Pack Up Your Sorrows," Gillian Welch's "Hard Times," and Carolyn Hester's version of "She Moved Through the Fair." Each had their own impact on the book or my thinking as I was developing specific characters. Thanks for taking a look at my playlist for Lay Down Your Weary Tune. I hope you check out the book, and I hope you go back and revisit some of these songs in their various forms.